Three Oshkosh Striker vehicles will join three others already on duty. OSHKOSH, WIS. (August 1, 2017) – Oshkosh Airport Products, LLC, an Oshkosh Corporation (NYSE: OSK) company, is delivering three more Oshkosh® Striker® 6 X 6 aircraft rescue and fire fighting (ARFF) vehicles to airports administered and operated by Servicios Aeroportuarios Bolivianos S.A. (SABSA) for the country of Bolivia. 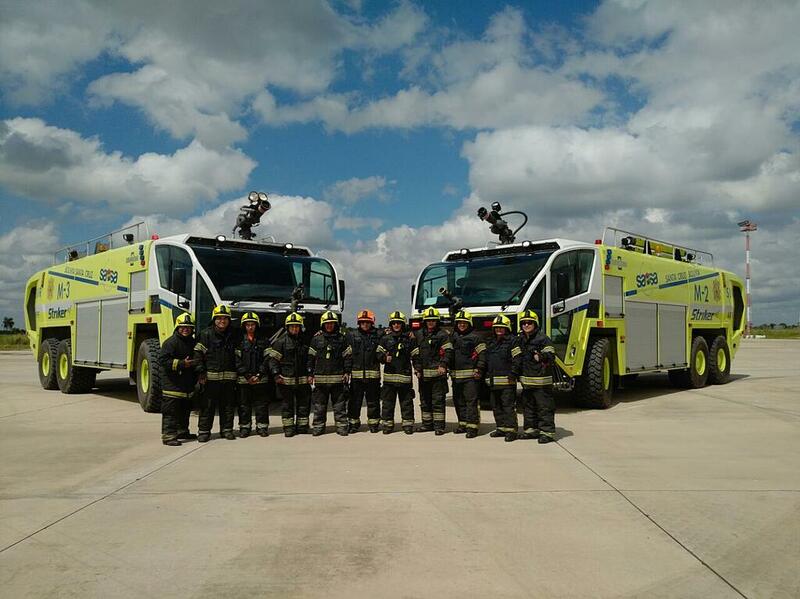 The Striker 6 X 6 apparatus will join three others already on duty; one each at the following airports: Viru Viru International Airport in Santa Cruz, Jorge Wilstermann International Airport in Cochabamba, and El Alto International Airport in La Paz. The second set of three Striker vehicles are shipped to the Port of Iquique, Chile where they are loaded onto flatbed vehicles for a challenging overland journey to their respective airports. The first delivery, to Viru Viru International Airport in Santa Cruz, was completed last month. The second and third deliveries – to Jorge Wilstermann International Airport in Cochabamba and El Alto International near La Paz – will take place later this summer. The Oshkosh Striker, available in 4 X 4, 6 X 6 and an all-new 8 X 8 configuration, feature advanced safety systems, innovative fire suppression technology, unmatched chassis performance, and unsurpassed reliability and durability. Each of the three Striker 6 X 6 vehicles for Bolivia is outfitted with a roof turret, an Oshkosh low attack bumper turret, and a dry chemical system. The engine power pack components are readily accessed through walk-in doors – on either side of the engine compartment – for easier servicing. In addition, the Striker serving at El Alto International Airport is equipped with a cold weather/high altitude package that includes piping inside the compartments to protect its firefighting components. SABSA is a nationalized company dedicated to the administration, modernization and expansion of the major airports in Bolivia. Viru Viru International Airport in Santa Cruz handles large commercial jets and is the hub for Bolivia’s largest airline. Jorge Wilstermann International Airport serves the Cochabamba region, and is situated at an elevation of 8,360 feet. El Alto International Airport is located eight miles southwest of La Paz and, at 4,061 meters (13,325 feet), is the highest elevation international airport in the world. Oshkosh Dealer, Leits Inc. – Specialty Vehicles Division, of Miami, Florida, provides service and support. This press release contains statements that the Company believes to be “forward-looking statements” within the meaning of the Private Securities Litigation Reform Act of 1995. All statements other than statements of historical fact, including, without limitation, statements regarding the Company’s future financial position, business strategy, targets, projected sales, costs, earnings, capital expenditures, debt levels and cash flows, and plans and objectives of management for future operations, are forward-looking statements. When used in this presentation, words such as “may,” “will,” “expect,” “intend,” “estimate,” “anticipate,” “believe,” “should,” “project” or “plan” or the negative thereof or variations thereon or similar terminology are generally intended to identify forward-looking statements. These forward-looking statements are not guarantees of future performance and are subject to risks, uncertainties, assumptions and other factors, some of which are beyond the Company’s control, which could cause actual results to differ materially from those expressed or implied by such forward-looking statements.